New York chef David Chang of Momofuku and the fine folks at McSweeney's recently came out with a hip new culinary magazine called Lucky Peach, and this first issue centered mainly on eggs and chicken. This grabbed my attention because I am eternally in search of the perfect egg. And beautiful as these different approaches are -- in particular the whipped cream and maple syrup topped wonder known as the Arpege Egg -- in all good conscience I have to mention Nanjing's version as my own contestant for the most divine version ever. First of all, the whites of the egg are deliciously flavored when done this way. 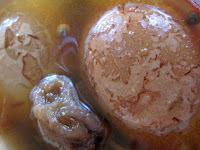 A good dousing of Shaoxing rice wine lends a heady sherry and mushroom aroma to the eggs. This is tastefully and tastily countered with an infusion of dried salted plums, ginger, lemon peel, and whole peppercorns that turns this from a one-note wonder into a dish worthy of the most finicky eater. Rarely do egg whites taste of much of anything, but here they serve as the perfectly flavored foil for a yolk that is molten. Yes, you read that right: the center here is soft and runs like liquid gold, but it's also cooked to just the absolute perfect degree so that while the yolk remains just this side of solid, you won't taste any rawness. Instead, the yolk serves as a delicate sauce for the white that cradles it. But this dish is not just about flavors and aromas - it's primarily all about texture. 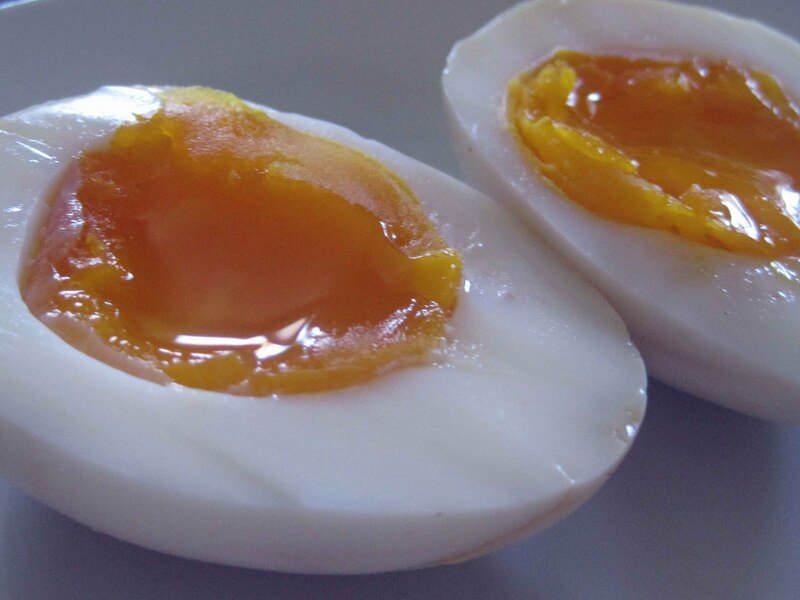 In most boiled egg recipes, the white is rendered into a relatively reasonable facsimile of a ping pong ball. Those that aren't tend to look soggy and runny and anything but appetizing. However, the folks in the Jiangsu capital of Nanjing have turned the practice of cooking an egg into the highest art, for the whites are cooked for a mere 30 seconds, made to sit in the hot water for another three minutes, and then quickly cooled down. What this does is to give the whites the texture of the tenderest custard, and the yolks are sent just barely over that fine line between raw and cooked. I've experimented with a bunch of different versions, happy to indulge my passion, and after tossing in this and taking out that, this has come to be my favorite way to prepare eggs, period. It isn't too sweet, but also has enough pizazz from the rice wine and dried sour plums and all those seasonings to make me sit up and take notice. You too can play around with the flavorings to your heart's content; just be sure and not use anything with, say, chicken fat or sesame oil, as the eggs should come across as clean and greaseless. Traditionally this dish is made with fresh duck eggs, but because they are relatively difficult to find in the States, I've substituted large hen eggs; feel free to use whatever type of eggs you like, but do know that you'll have to experiment a bit in order to get the texture the way you want it, since the size of the egg will greatly affect the cooking time. The only caveat I want to make is that the eggs should be organic and free range; the better quality egg you use, the better the result, since this is after all just about one ingredient. The eggs are best when they are about a week old in order to make them easier to peel. Bring them to room temperature before cooking in order to a) have the perfect cooking time and b) keep them from bursting. 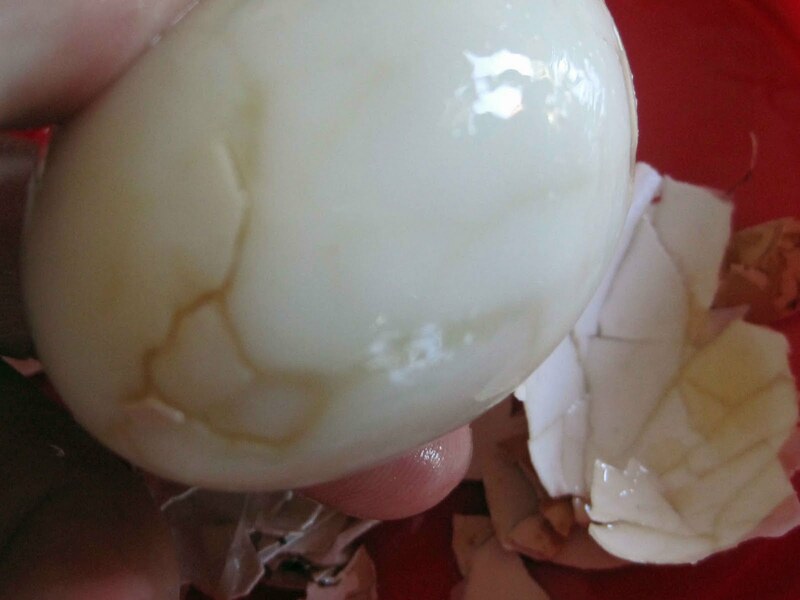 I like to prick the round ends of the eggs with a large tack, since there's a little air pocket in there, and if you give the air an escape route, the whites will be able to swell without breaking the shells. The only unusual ingredients here are the dried salted plums, called huamei. You can find these in just about any Chinese grocery store in the candy aisle. 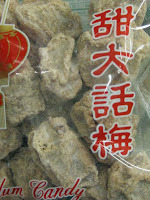 They are very tart and sweet and salty all at the same time, and usually used as a tea snack. However, I like pouring boiling water over a couple to make a tasty beverage for summer; just chill the infusion, add fresh lemon juice to cut the sweetness, and dribble it over a glass full of ice. Instant refreshment! 1. 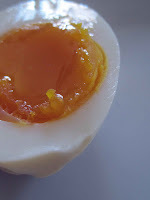 Use a sharp tack or pin to poke a hole in the round end of the egg; just barely break through the shell without puncturing the inside of the egg. 2. Place the eggs in a small saucepan and cover with cool tap water by about 1 inch. Place the pan uncovered on the stove and bring to a boil. As soon as the water comes to a full boil, where big bubbles are bursting over the surface, start counting down 30 seconds. At the end of 30 seconds, remove the pan from the heat, cover, and wait exactly 3 minutes. Then, immediately drain the eggs and cover them with cool tap water. Change the water a few times until the water remains cool. Drain the eggs and lightly crack them all over with the back of a spoon, but don't remove the shell. 3. Clean the saucepan and bring the filtered water, dried salted plums, ginger, salt, peppercorns, and lemon zest to a boil; lower the heat to a bare simmer and cook the marinade for around 5 minutes. Allow the marinade to cool to room temperature and add the rice wine. 5. Serve the eggs as a simple appetizer by slicing them in half and serving on any light and refreshing vegetable, like microgreens or radish shoots or finely shredded leeks. Or, serve them as a summer breakfast on hot toast, with noodles or Congee, or as a midnight snack. It's hard to go wrong with this, the perfect egg. oh my gosh, this looks delicious! i will have to try this soon. would it work with Japanese style salted plums (umeboshi) as well, do you think? I just bought a jar of locally produced ones in Japantown at Super Mira. That is a really intriguing idea. I don't see why not. Depending upon how salty your umeboshi are, you might want to add a few extra, as well as some of the liquid and the shiso (perilla) leaves to add to the flavor. I'd suggest that you use not more than the 6 eggs the first time around just in case the eggs are not as tasty as you'd like. But experimenting is half the fun of cooking! Let me know how they turn out, as I might try them myself, and thanks for your kind comments.